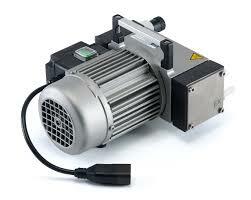 The RE3011C is a powerful, compact vacuum pump. It features a rugged design combined with simple on/off operation, making it the perfect choice for delivery of a quick, reliable vacuum. The RE3011C is a dry, oil free, diaphragm pump making it ideal for use with the Stuart rotary evaporator or for any applications requiring vacuum. By utilising a pump to place the rotary evaporator under vacuum, distillation efficiency is greatly improved. By reducing the pressure within the glassware of the rotary evaporator solvents can be evaporated off at lower temperatures ensuring the bath can be kept at a safer temperature.